GLASTONBURY, CT – December 13, 2017 – CMIC Group, an A- (A.M. Best) rated company and leading member-owned medical professional liability insurance provider, announced today that Chief Financial Officer, Emmanuel (Manny) Zervos, will retire at the end of the year. Prior to joining CMIC, Mr. Zervos held several positions with Emhart Corporation, a Fortune 500 multinational company, including Director of Finance and Operations, and also worked at Deloitte and Touche, LLP. 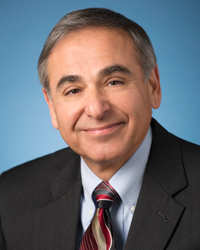 A graduate of the University of Connecticut with a degree in Accounting, Mr. Zervos is also a member of the American Institute of Certified Public Accountants and the Connecticut Society of Certified Public Accountants. He has served as CMIC’s Chief Financial Officer since 1989. The role of Chief Financial Officer will be assumed by Michael Conneely of Wethersfield, Connecticut, the company’s current Director of Finance.